The last few weeks have seen our luck run out with the weather as glorious sunshine shone through the week only for the clouds and rain to roll in at the weekends. The weekend of the 16th of August looked to be not too bad so on the saturday me, Jon and Kirsty headed off to the north coast of Norfolk to try and see another species of butterfly we hadn't caught up with this so far year. A birding friend of mine who lives in Norfolk (Kieran Nixon) offered to be our guide for the day while we looked for it so after picking him up we found ourselves searching the sea bank near Cley. Unfortunately the forecast of long sunny spells never materialised and a heavy layer of thick grey clouds soon made any blue patches of sky disappear. To add to this the wind was becoming quite strong and was an almost straight westerly which ripped straight along the coast leaving very few sheltered areas. It was very apparant that if we were going to see Grayling it certainly wouldn't be here with weather like this so we took Kieran's advice and decided to head inland to Holt Country Park hoping it will be a little less windy. As we arrived on site the cloud started to break up and we had some brief sunny spells. When the sun did come out the place came alive with numerous Gatekeepers and Meadow Brown and we also had a nice surprise as a Wall Brown made an appearance in the meadow. We found the bare patch of earth where the Grayling are normally found but by now the sun had gone back in and it was looking quiet again. We walked round and round but with no luck and it was looking very likely that we were going to dip. Kieran and Jon had found a male Black Keeled Skimmer which provided a bit of entertainment while trying to get a pic and as they chased it I carried on with the Grayling vigil. 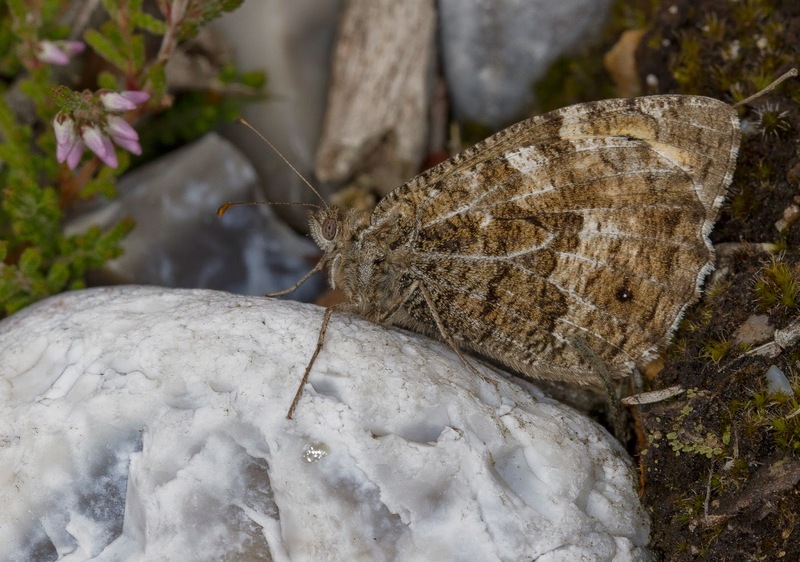 Suddenly as I crashed through a patch of heather a large brown butterfly took off and landed a few feet away, at last a Grayling! 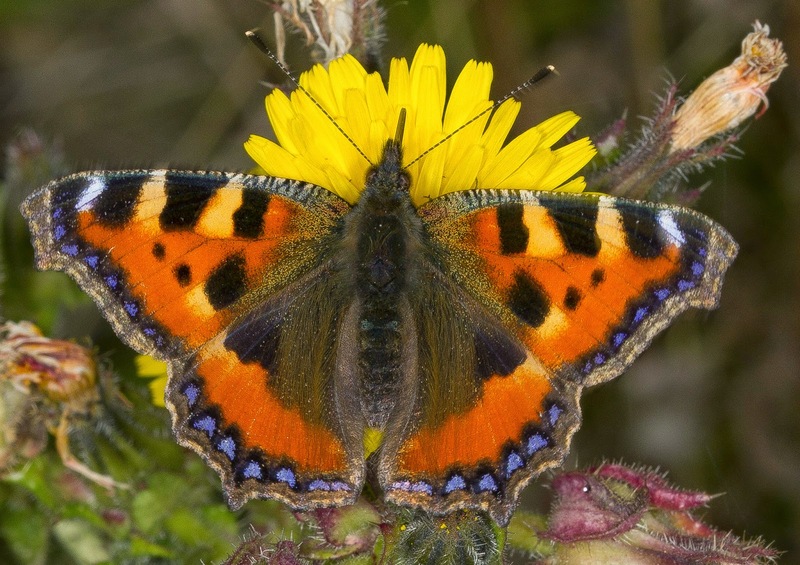 A large sigh of relief was exhaled as I called the others over for our 51st butterfly for 2014. Once everyone had seen it we then went closer to get some pics and despite the cool conditions it was surprisingly active. 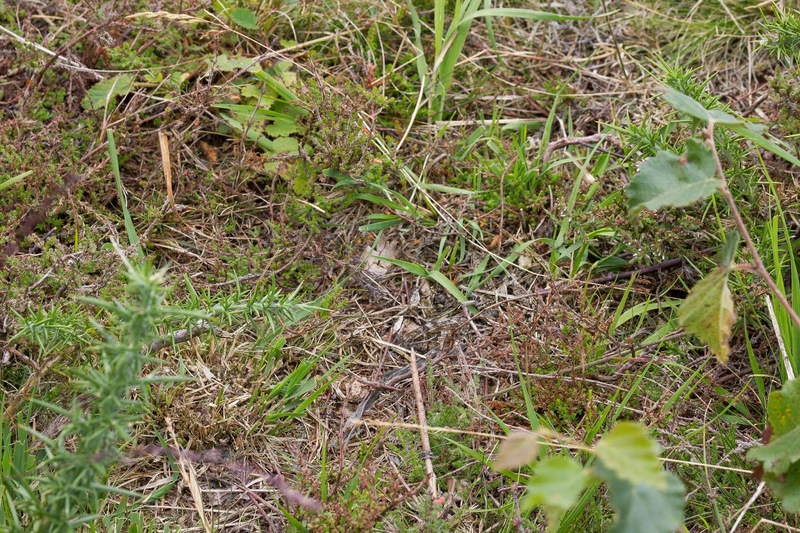 We got some good shots of it close up and I also couldn't resist a distant shot to show how well camouflaged they are. 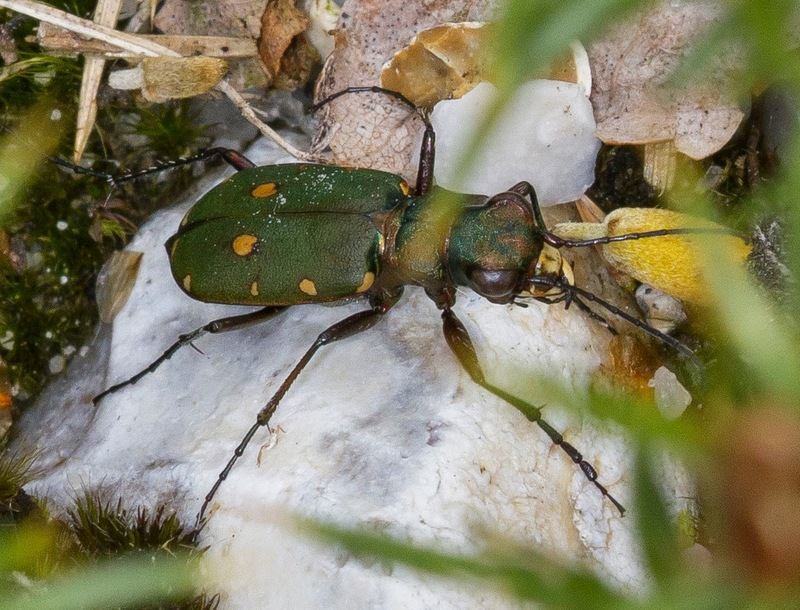 We managed to see at least two or three while we were there but the other highlight was found by Kirsty as she discovered a Tiger Beetle running through the stones. A real challenge to photograph as it ran like mad. It always amazes me how something so small can run such a long way without stopping once! We got some fairly good pics but I couldn't get a clear one of the jaws, I've included a record shot of it under some vegetation to show those magnificent mandibles! 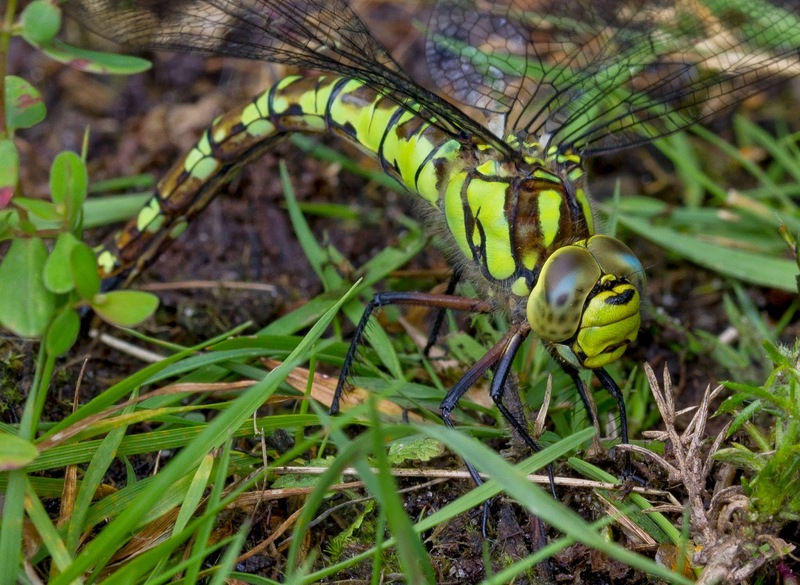 We also had some good views of a magnificent female Southern Hawker egg laying on the bank by the pond further down the hill. 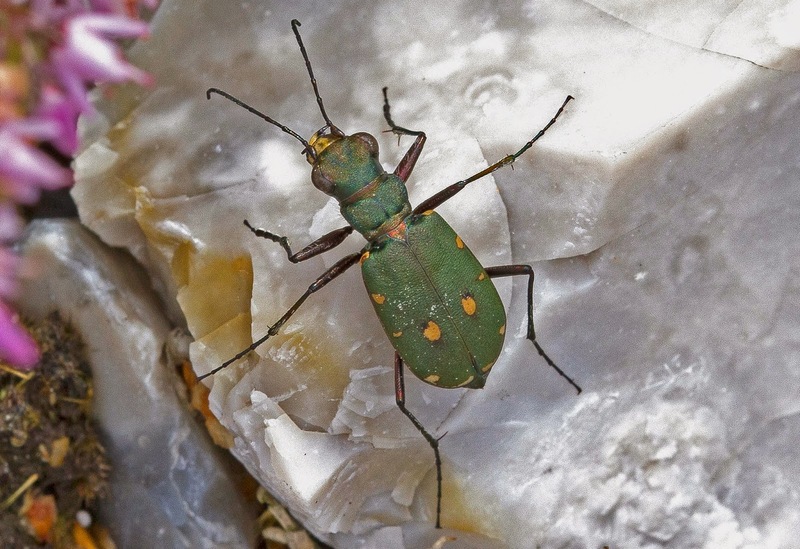 She was a stunning shade of green and brought a dash of colour to an otherwise grey day. We decided to call it a day at this point so we headed to the fantastic Dun Cow in Salthouse for a lovely Fish Pie washed down with a couple of pints to celebrate another butterfly species to the yearlist. 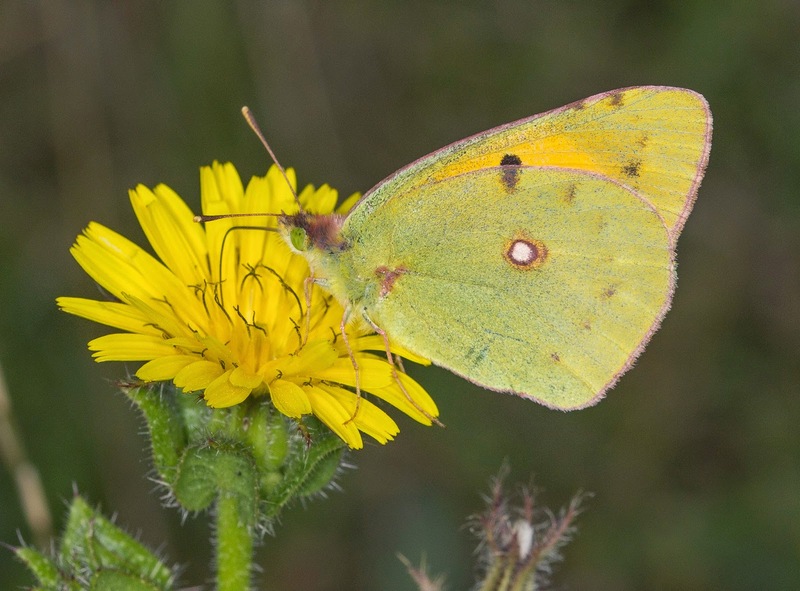 The following day (Sunday the 17th Aug) I went to my local site at Grange Park and was very pleased to see that Clouded Yellows had found the site again. I managed to get three in total in the end with a female half way down the bank and two males which ended up fighting each other at the far end near the blanket of Trefoil. I managed to get a couple of pics despite them being very active. Along with the Clouded Yellows there were lots of Small Heath, Common Blues, Brown Argus, Small Tortoiseshells and Peacocks. 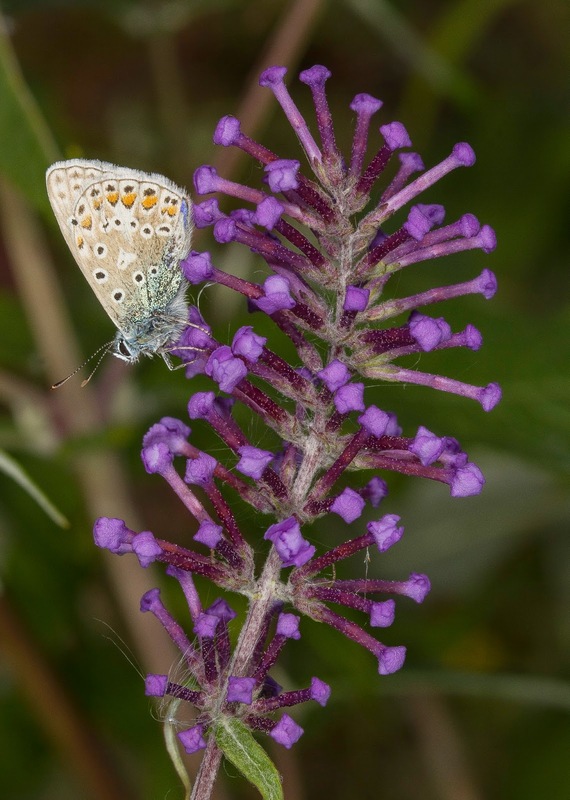 I returned the following week (Sunday 24/08/14) but found significantly less butterflies but this may have been due to the fairly cool breeze blowing across the site. 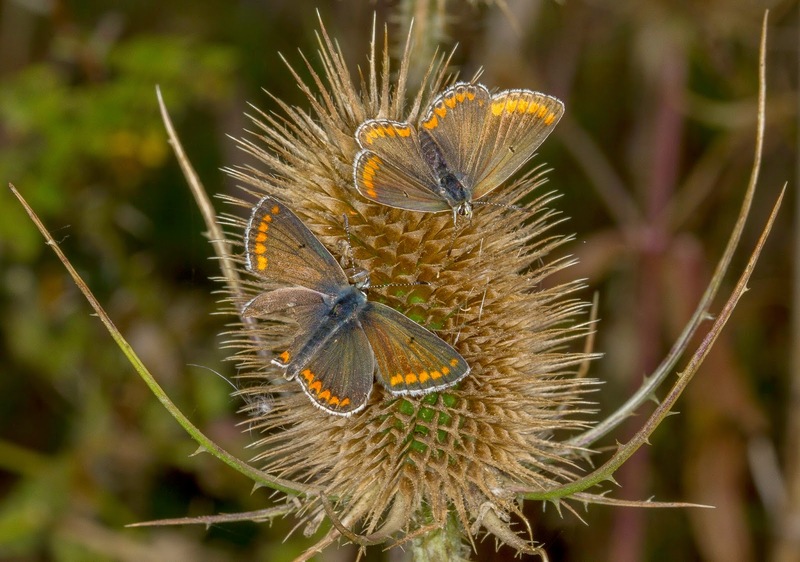 I did see plenty of Common Blues and lots of Brown Argus, in fact probably more Brown Argus than I have ever seen in one place at one time showing a good second emergence of both species. Small Tortoiseshells were also evident feeding on the tops of the Ragwort and a couple of pristine Red Admiral were also there. 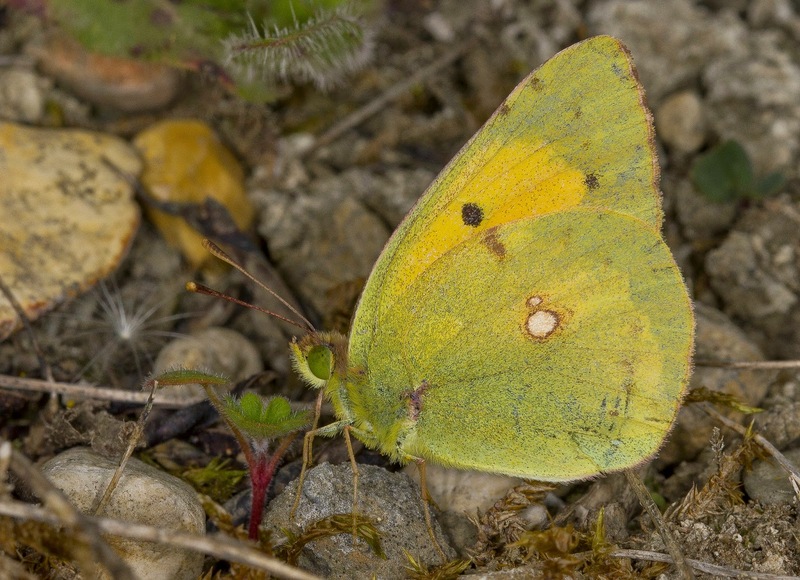 As I was making my way to the car I at last saw yellow butterfly whirling along the bank towards me and after a bit of a chase it landed and I got some pics. Looking at the photos at home I could see that this was one of the males from the week before (compare to the above photo of the Clouded Yellow with the small nick in the hindwing) and this is one of the benefits of digital photography as no two Clouded Yellows are the same and it's with study of the tiny markings on the wings you can track individual butterflies. 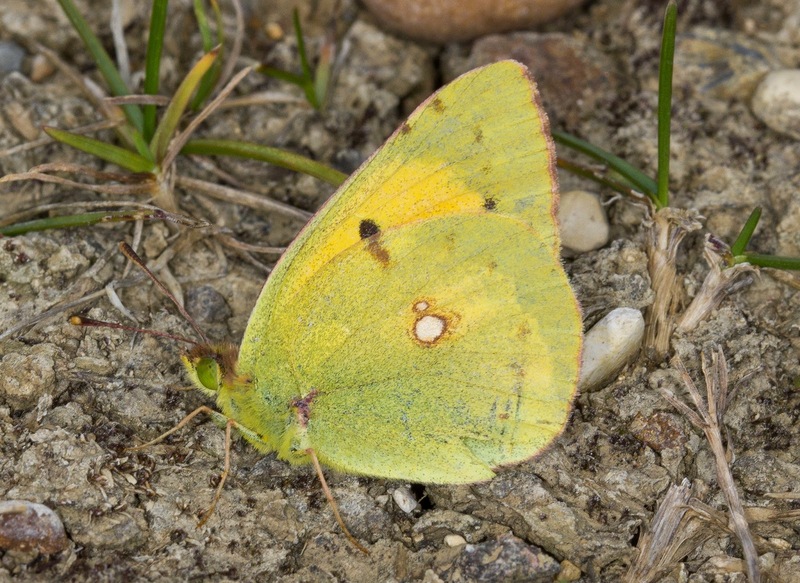 This is why I have such a huge Clouded Yellow library on my laptop as I try and take detailed pics of all the ones I see here. It was so still I also took the opportunity to grab a video and I had to give it a nudge at the end to get it to move. Here too is a few pics of some of the other species present. It seems a lot of the second emergence butterflies are now starting to look tatty so maybe the 2014 butterfly season is now slowly coming to an end. It's been quite a ride trying to see as many as we could and I recommend anyone to do it at least once if they have an interest in them. It's the Arnside Knott trip got rained off as we could've got a few more but that's wildlife watching for you, if it was too easy it wouldn't be so much fun would it?